A Chinese secret society with 6 million members, including 1.8 million Asian gangsters and 100,000 professional assassins, have targeted Illuminati members if they proceed with world depopulation plans, according to Tokyo-based journalist Benjamin Fulford, 46. They contacted Fulford, a Canadian ex pat, after he warned that the Illuminati plan to reduce the Asian population to just 500 million by means of race-specific biological weapons. "The Illuminati, with the exception of Japan, is very much a white man's game," Fulford says. The secret society confirmed Fulford's information and asked him for advice. He provided a list of 10,000 people associated with the Illuminati, mainly members of the Bilderberg, CFR and Skull and Bones. Neo Cons are also high priority targets. "I have been promised that not a single person will die if they negotiate in good faith," Fulford says. Fulford is the former Asian Pacific bureau chief for Forbes magazine. He quit in disgust when Forbes refused to run a damaging story about one of its advertisers. Fulford has since written 15 books in Japanese. His most recent is a scathing dissection of the 9-11 Hoax. 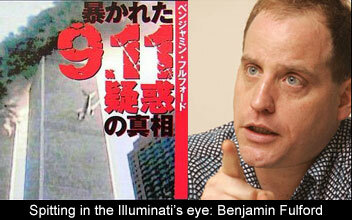 Fulford says Japan has been controlled in secret by the Illuminati through the use of murder and bribery. Underground sources tell him the Americans have murdered over 200 Japanese politicians and influential citizens since the end of WW2. Last edited by zengrifter; June 30th, 2007 at 02:24 PM. The earliest verifiable links go back to when the Khazar empire was destroyed by the Mongols and the Russians about 1,000 years ago. At the time their elite class fled with their treasure into Europe and China. The group that fled to China then fled to Japan as Kublai Khan's armies conquered China. That is why the Star of David can be seen in 1,000 year-old shrines in Japan. The original Khazars were fully assimilated by the Japanese elite over the ensuing centuries but certain Freemason/Khazar influences became a permanent part of Japanese culture. After Admiral Perry arrived and forced the Japanese to open up their economy, the Rothschild's man in Asia, Jardine Matheson, sent an agent to Japan. His name was Thomas Blake Glover and his mission was to create a new arms market by starting a civil war in Japan. The ultimate aim of this war was to prepare Japan for colonization. He managed to sell some battleships and weapons but in the end, Glover's plot was uncovered and he was driven into bankruptcy. By this time, learning of the association with their long lost cousins, the Freemasons decided on a different approach. A different Rothschild Freemason agent, Guido H.F. Verbeck, started a very successful Japanese franchise. He is the man in the center of this photograph. The people around him are the founding fathers of modern Japan and the senior members of the original modern Freemason lodge. They set up the Meiji emperor as their symbol and modernized Japan. The way Asians view Western history is astounding beyond imagination. We learn that everything we have been taught is a lie. We learn that we are being manipulated and herded like sheep by a secret elite. We learn that we live in a matrix of lies designed to keep us in slavery. The implications are so vast that it is hard to know where to begin. Ultimately, to really understand, we must go back to the beginnings of Western civilization. At the very dawn of history humans began farming along the banks of Euphrates river. People soon started digging canals. The resulting cornucopia created a population boom. Fights between alpha males escalated into a never-ending frenzy. From these constant battles for supremacy arose a tyrant who created a system for manipulating and controlling large masses of people. It was a system of laws combined with a system of mind control. His name was Hamurabi. His system of mind control was to create a book combining folk wisdom with propaganda. Because he could not be everywhere at once, he created the idea of an omnicient, omnipresent being that could see all and know all. In the book where this idea was introduced, Hamurabi had himself referred to as Abraham. Later a symbol of that god was created: it was an all seeing eye on the top of a pyramid. So, while the Mesopotamian people built on the idea of an almighty God, there also actually existed, behind the scenes, a bearded man on a throne with god-like powers over his people. To control and awe his people, great displays of miracles and wonders were engineered. A special sect of slave drivers was created to control the people on behalf of the god-king. This was the origin of the Freemasons. It took place 5771 years ago. Later the tribe of the god-king invaded Egypt and the Masons added Egyptian slave driving technology to their arsenal. Thus started, over the millenia, a sort of parallel cultural evolution between a ruling elite and the unwashed masses. We saw the rise of a group of elite families that keep their rule over the ignorant through a combination of control over grain supplies (or money supplies), knowledge, information and finally, control over life and death. People who learned about this elite were either inducted into it, killed or neutralized by assorted other means such as bankruptcy or ridicule. FULFORD: Another way they look at Western society is as a slave society. RENSE: Well, we call them Illuminati, we call them Bilderbergers, CFR, Trilateral Commission. We can throw in Skull and Bones, the Club of Rome, the Fabian Society - all sorts of secret cartels, cabals and groups. But at the top, it's a fairly singular power source, and it is certainly one of slave-owner to slaves. FULFORD: I brought [a case against] David Rockefeller. I actually was able to link him to some murders of bankers and other people in Japan, as a part of his effort to take over the Japanese financial system. When I confronted the former Japanese finance minister, Heizo Takanaka (ph) with this, he sent a ninja, believe it or not - a real live ninja - who offered me a gold Freemason badge. He told me I could either accept a job of great power or be killed. At first I thought I had no choice, I had to go along, which is what happens to a lot of people when they get pulled into this. But then the Chinese secret society showed up and offered me protection. So that's why I can talk about this. Last edited by zengrifter; July 13th, 2007 at 12:20 AM. how the ninja wanted to kill him and the chineese offered protection so he opted that way . As I told my grandson - " Learn Chineese in College and you will be fine ." The secret government of the US and EU has promised a major overhaul in the wake of the warning it got from the Chinese secret society, according to a senior Japanese public security police officer and Freemason who has been acting as an intermediary with the Chinese secret society. "Expect big changes this autumn," he said in comments confirmed by a member of the Japanese royal family. "What you will be seeing is the unwinding of George Bush, senior's 50-year campaign to turn the U.S. into a fascist regime," the secret police agent says. "George Bush senior is now a broken man showing signs of senile dementia," he adds. "They [The illuminati] know their rule is ending but they do not want it to end in an ugly way," the security police source says. The recent market turmoil, including the Chinese threat to sell dollars, was part of the bargaining towards major changes in the secret balance of power, we are told. Certainly, there are some encouraging signs. The tearful resignation of U.S. presidential "brain" Karl Rove removes a central lynchpin of Bush's regime. Since it follows six other resignations, it does look like rats abandoning a sinking ship.